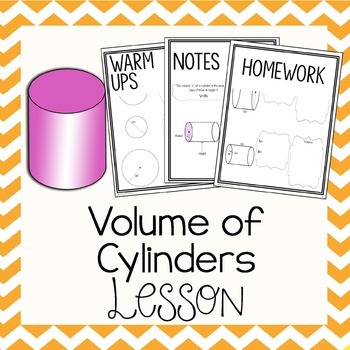 This set of worksheets includes 2 warm ups, 3 pages of in class notes, and 2 pages of homework to help teach and strengthen students’ skills in calculating volume of cylinders. 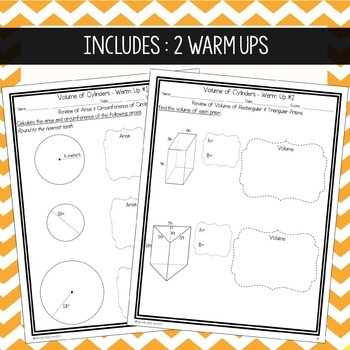 • Included are two worksheets intended to be used as warm ups. The first warm up is a review of circumference and area. The second warm up is a review of volume of rectangular & triangular prisms. 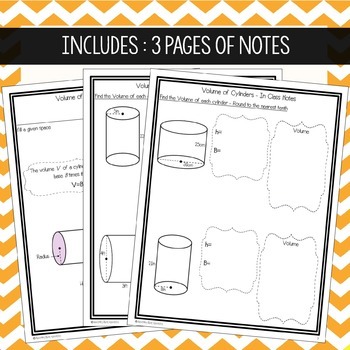 • The 3 pages of notes introduce the volume formula and give 4 examples to be worked through as a class. 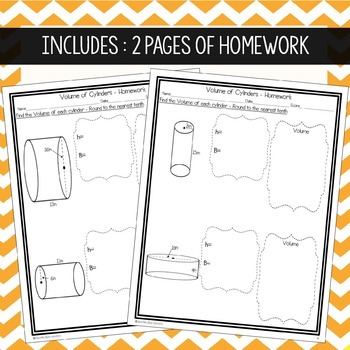 • The 2 pages of homework include 4 cylinders that students must find the volume of. All pages are shown in the preview. Please view the preview if you are unsure that this product is right for your classroom.